Are Birders More Perceptive Than Non-Birders? It has been said many times that birders are always birding. Once you are turned on to birds it is virtually impossible to be turned off of birds and if you are truly a birder your location and current (alleged) activity matter not a whit – you are birding. And once you really get into birding you can’t help but notice insects and other bugs, plants, mammals, reptiles, and the entire gamut of life with which we share the world. Beyond that, you become aware in general of your place in the universe, and this revelation might lead you to a greater understanding of your surroundings. Not convinced? Let’s look at this issue a little more in depth. When birding (which is always) have you ever noticed a shadow racing along the ground because some fast moving object has moved between the sun and the ground near you? Do you look up to see what made the shadow? I do every single time and I have noticed other birders doing the same thing (and they almost always look in the correct direction because they already are aware of the sun’s position). I have NEVER seen a non-birder look up in similar circumstances, whether because they do not notice the shadow or because it does not make them interested enough to look up into the sky. 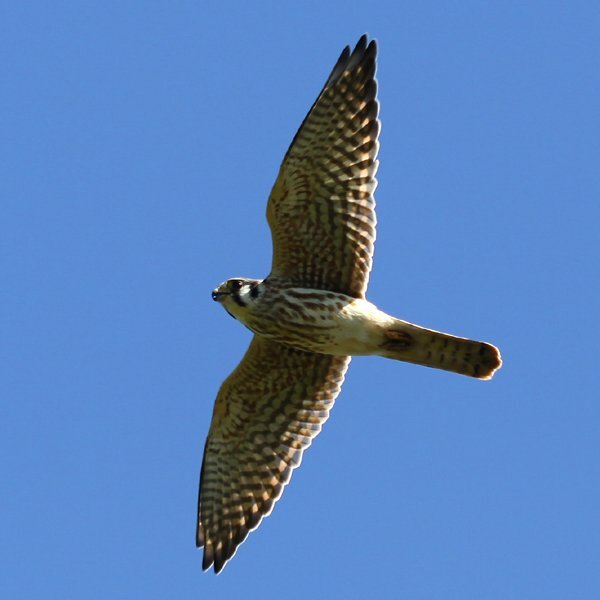 This means that when I am with non-birding friends I often get to point out interesting things in the sky like blimps, odd planes, helicopters, hot air balloons, and, yes, sometimes birds, like the female American Kestrel to the left. When I am asked how I knew to look up and I explain how I saw a shadow moving along the ground people tend to be impressed but I wouldn’t expect any birders reading this to be impressed because, after all, this is just what birders do. To some degree birders are more perceptive because we think like wild animals. After all, if you want to really understand another creature you have to be able to perceive its motivations, its needs, its habits. To do that you have to put yourself in the animal’s skin (no, I am not advocating for you to get a new fur coat). This explains why birders take note of what plants produce seeds or fruit and when. Birders not only check the weather in order to see if it is going to be raining but also to see what way the wind is blowing, if a front is coming, and the times that these things are happening. After all, if it is spring and there are south winds in the evening and a front moves through with heavy rain at four in the morning then birders are going to be out looking in the morning for migrants forced down by the rain. When a birder is actually out birding and hears an alarm call from a jay or a squirrel the birder will look for what caused the alarm. Wanting to know how different birds react to different situations forces birders to be more aware of what situations change behavior. Being more aware of what the baseline is makes birders more sensitive to changes and more likely to notice them. I can’t even begin to count the number of falcons I have spotted because I scanned the skies after other birds took off for no apparent reason. Ditto for hawks or other predators spotted because the forest went silent or because some creature gave an alarm call. To some degree these enhanced perceptions apply to anyone who spends a lot of time in the outdoors but birders (and hunters) are even more focused because our activity depends so much on being aware of sound and sight. It is no wonder, then, that this awareness of the surroundings might translate outside of the birding realm to the “real world.” Everyone knows the moment in the movie when the really bad guy steps into the room and everyone notices and goes quiet except for the poor sap with his back to the door who has no idea of the world of hurt he is about to enter. That poor sap will never be a birder worth his salt. After all, a birder would have correctly interpreted the sudden silence as a signal of a nearby menace, looked around for a predator, and avoided being pummeled. Learning the field marks of a host of birds forces birders to notice detail more than most people and most people have heard of how Roger Tory Peterson’s identification system for birds was adapted to planes for World War II so plane spotters would know if a Zero or a Messerschmidt was approaching on a bombing or strafing run. If you have ever birded in a group and spotted a fellow birder in the distance you have probably had the discussion of how people have field marks too. Because birders train their minds to notice slight differences in the bird world they are more able to notice slight differences in the non-birding world as well. I think there are various types of expertise that will increase perception of certain characteristics of the landscape. Archaeologists and palaeontologists who do a lot of fieldwalking would probably find an entire Roman Legion or mammoth burial ground in the same field that a birder would dismiss as having nothing but trash-birds. Architects and art historians would find layers of interest in cities that we wouldn’t see as anything other than backdrop for nesting storks, and botanists would find as much complexity and interest in a forest as we would, only we’d find differing levels of avian and botanical complexity. Soldiers might perceive a copse and hedge network in an entirely different way, seeing all the potential cover and likely traps. And who knows how artists look at the world. Basically, yes I know I see things that others don’t, but I don’t imagine that is all there is too see. I don’t care about cover from snipers, I care about buntings, but I don’t imagine that order of priorities is necessarily correct! We realised how much we heard was so relevant to what we saw when we spent a few hours with a deaf birder. I think we are generally a lot more observant than non-birders, but we may well just be observant people, which is why we even noticed the birds in the first place! Actually, thinking about it some more I think it has more to do with filters than perception. As I noted above the landscape is filled with multiple layers of information, faunal, botanical, cultural, historical, threats, friends, economic, etc etc etc. We’d be overwhelmed if we absorbed all of it, so we have subconcious filters that remove the unimportant details so that we can, essentially, focus on what matters. (This is why listening to someone on the phone is so annoying btw. The filters can’t block it out because it sounds wrong (half a conversation) so they make the concious mind listen and make the call). This is how we can walk down a crowded city street without going nuts. As birders we are trained to stop the relevant filters. Instead of dismissing small movements or sounds we actively look for them some of the time and are receptive to them the rest of the time. Our filters still work perfectly well for other things. As I note above other professions or hobbies suppress other filters. On a jet-boating tour in Idaho’s Hell’s Canyon a few years ago, it was obvious that the hunters on board and me, the birder, were able to spot the wildlife much more quickly than the other guests. Our eyes were trained to spot things in the landscape that were “different”. I think birders are pre-disposed to be observant and then that skill is honed once you take up birding. I know friends have always commented about how much more I seem to notice than they do – not just birds but nature in general. I agree that once you are turned on to birding you are birding all the time! I made similar observation on my blog when I took up the challenge to “become a proper birder” this year. I think, like with most things in Life, there are two sides to the coin. The ones that are perceptive and the ones that aren’t. I’ve always been interested in nature, but more in the overall world of it, not in particular names or species. Since I first grabbed a camera, that changed and I started with the small things and from there got to the birds. But I’ve seen enough people that call themselves birders and see not much, but the names of the birds and the tick they earned by seeing it. And in fact, we ARE more good looking and charming. But of course. I agree with Duncan … one focuses on what’s important at that moment in time. – If someone just purchased a yellow VW, then that person will notice all the yellow VW’s that pass by. – If a person is interested in hooking up, then they will notice people who fit the proper description. – At the right times, one will notice all the possible bathrooms. I have found that birders are more observant than average, but we’re not the only observant ones. Hunters, military people, scientists from other disciplines, etc. all tend to be pretty observant. It’s people who don’t seem to have much in the way of any special observational interest who are most surprised by my own observations. My own observational skill is focused on outdoor things. Perhaps people who are, say, really in to cooking will see all kinds of things related to that where I won’t notice it at all. They may be more taste-focused or more scent-focused, while birding is sight- and sound-focused. Birders are definately more tuned in to picking up movement and out of place objects. I can’t hold a conversation without my eyes flicking away to lock onto a movement or sound in the vicinity. I was just having a discussion about something similar yesterday. My background is as a wild and domestic animal trainer. But my observation skills for nuances are far about the average person. Part of this is due to filters and habituation, as mentioned earlier in the thread, but I also think it is a predisposition or skill set that some people have and that others develop–and then there are those who never get it. So I think interest and passion fuel the skill set but that just “being” also enhance the powers of observation. Many people are just to preoccupied or too busy talking to really connectd and notice. I think birders are more perceptive, but our observational skills are trained to notice specific things that might indicate the presence of birds or the identity of a bird. Knowing to check a stand of conifers for finches and owls doesn’t necessarily translate into knowing that there’s danger lurking behind the next hedgerow. So I agree with Duncan. The exception would be if a birder has experience with the observational skills needed in other areas. @Everyone: Lots of good points here and I have enjoyed the comments. But I proved beyond a doubt that birders aren’t all that perceptive because the image I called an American Kestrel is actually a Merlin. I just took a train to New York from Washington, D.C. and it was hard for me to carry on a conversation with my colleague who sat to my right when I kept seeing things out of the corner of my eye through the window to my left _ nests, a bunch of what appeared to be herons, many empty nests and of course lots of habitat to search. I’m an amateur, so I’m still working on my observation skills, but the expert birders I’ve met are very detail oriented, meticulous people. I think you have to be or have to develop those skills to be a good birder. @Suzanne: I had a huge number of Bald Eagles on my recent train ride along the Hudson and I was keeping an eye on my fellow passengers and I don’t think a single other person saw them.